On a hot Sunday afternoon in August it suddenly dawned on me that I only have a few more Sundays left in this city. 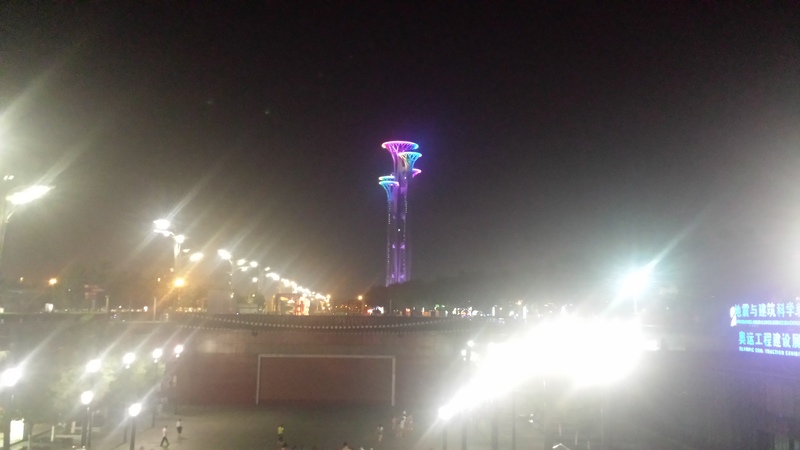 Although I have already seen quite a few of the famous, not so famous and rather infamous sights here in Beijing I have never been to the Olympic park. I was at home with the air-condition running and the idea of leaving my perfectly tempered room to hop on my bike and cycle to the subway station in 35C, to then being squeezed in the subway against hundreds of other sweaty people and to then walk around the area in 34 C (I am an optimistic person) with thousands of other people, just did not sound overly tempting. But I also really wanted to explore the city, because who knows if I ever return . So my curiosity eventually beat my laziness and I got up, left my house, cycled to the subway station, arrived there drenched in sweat, hopped on the subway, enjoyed the sweat of other people and arrived at the Olympic area only to realise that I was not the only person who had the idea to come here. 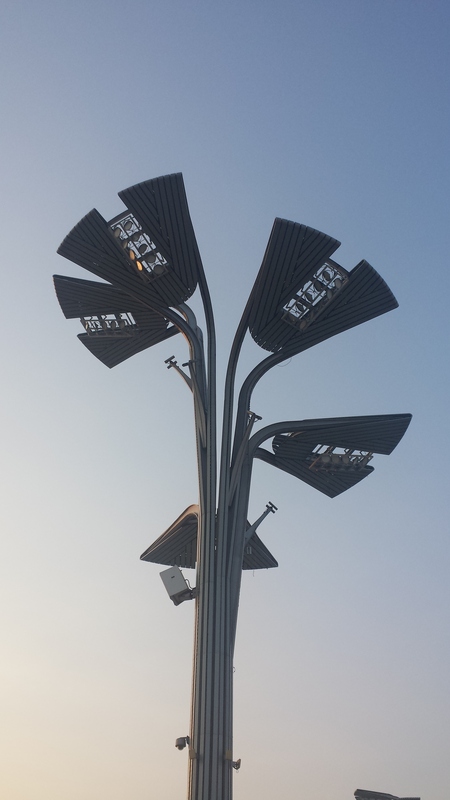 The Olympic park, as a testament of its significance, is on the city’s north-south axis, which also includes the Forbidden City, Tian’anmen Square and the Temple of Heaven. I will speak more about this in one of my next blog posts. When I left the subway station I immediately found myself in another shopping mall – what a surprise. It seems there are shopping malls EVERYWHERE in Beijing. What I did find interesting were these kids practising what looked like something in-between rollerblading and skateboarding. And this is the view I enjoyed walking from the subway station towards the Olympic stadium. Quite impressive, I think. The first thing which caught my eye, apart from the thousands of other human beings, was the Ling Long Pagoda (left picture). Ling Long means delicate and is thus referred to as the Delicate Tower. 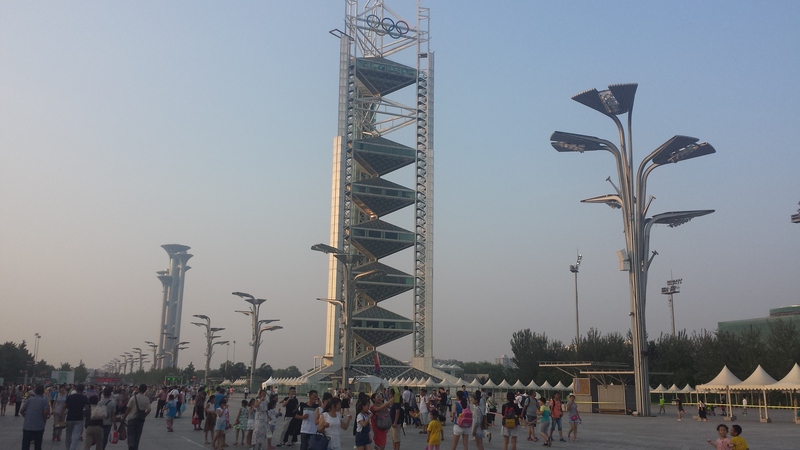 It is 128 m tall and on top of it are the Olympic rings. 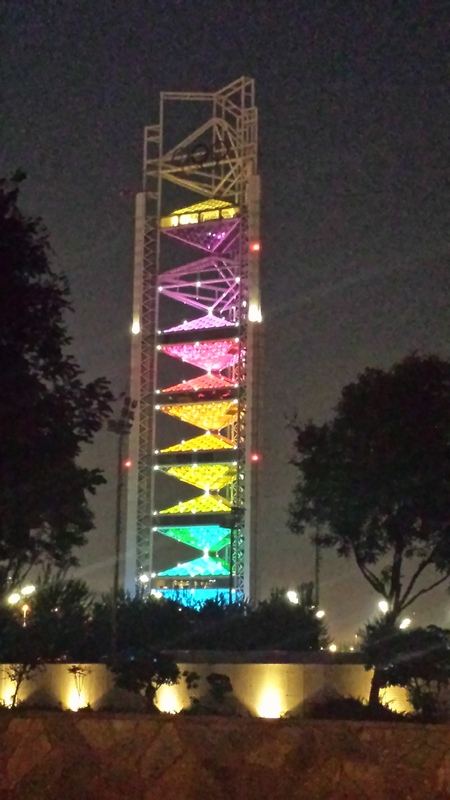 Apparently, the tower is operated by Beijing Olympic Broadcasting and some of the international broadcast studios are located there – could imagine a worse place to work. 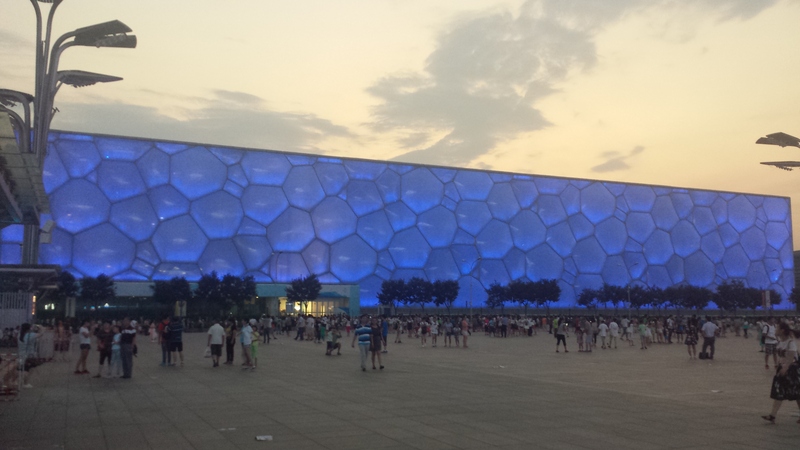 And then I could catch a first glimpse of the famous Bird’s Nest stadium. 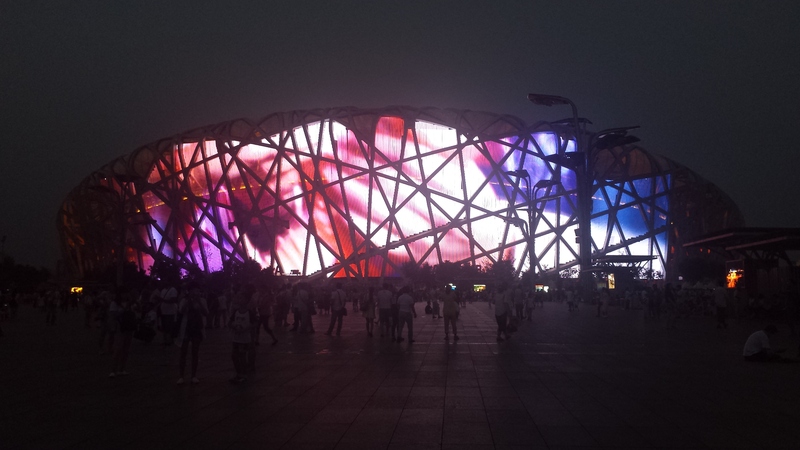 The stadium cost US$428 million – yes, China loves to impress, but although this number is already quite mind-blowing it was only a tiny fraction of the 40 billion USD spent on Beijing in preparation for the Olympics. 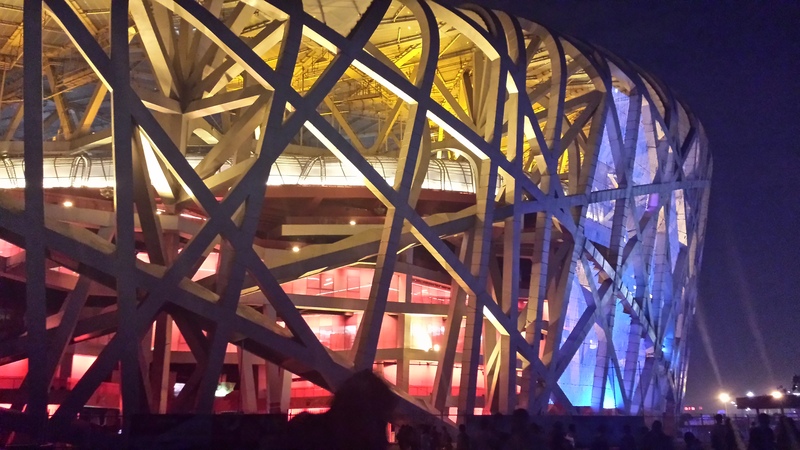 The Bird’s Nest was designed by Swiss Architects, Herzog & de Meuron, Chinese Architect, Li Xinggang and Ai Wei Wei, who was the artistic consultant, but has since then distanced himself from the project (due to political reasons). The requirements for its design were that it had to be inspiring and be able to withstand an earthquake (due to Beijing’s location).The design came from the idea of a single thread wrapped round a ball. The stadium officially opened on 28 June 2008 and has a capacity of 80.000 people. 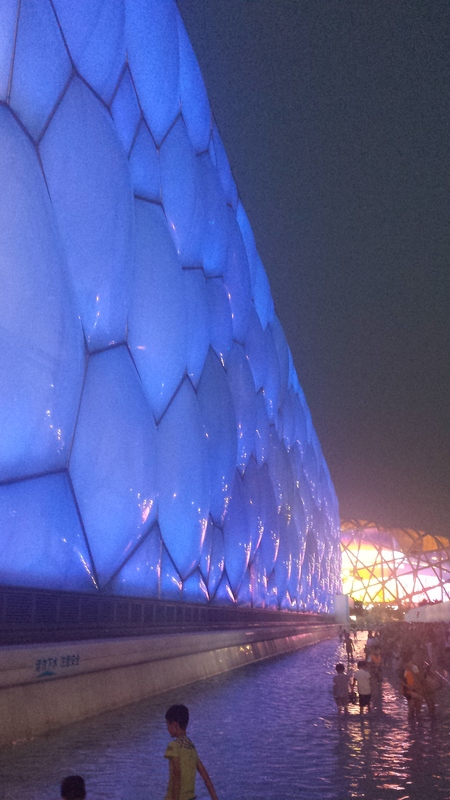 As with many Olympic venues the Bird’s nest also seems to have trouble attracting events these days. But surely it is poplar with tourists. And here are some more pictures I took. Actually, it ended up being a beautiful evening. Watching the hustle & bustle around me, enjoying the beautiful sunset and illuminations whilst listening to some relaxing music. I am glad I left my comfortable room, because I would not have wanted to miss out on this experience.